Already this is shaping up to be a good Monday. Why? Because my boy QE just passed a tip that one of my favourite directors, Neil Marshall is currently writing an alien invasion film that takes place during World War II. Right, so we just got Black Hawk Down meets War of the Worlds in Battle: LA and now there's a chance we're getting one of them meets Saving Private Ryan. Bring it! Our pal Phil at Live for Films got the scoop at the Jameson Empire Awards and if you don't beleive the validity you can hear it from Marshall's own lips after the break. Just look at that smile on his face as he says it. This thing's either already been picked up byb a studio and he knows he shouldn't be spilling the beans, or he knows it's going to be epic. 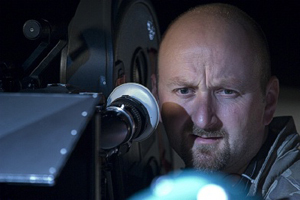 Neil Marshall's Dog Soldiers, The Descent, Doomsday and Centurion are all available on Bluray! Isn&Acirc;&acute;there already a similar Movie in Production? "The Tank"? Awesome! I was wondering what he was up to these days. One of my favourite directors. He seems to home in on all of my different interests in all his movies. Sounds like Turtldove's WWII Sci Fi series. I was gonna say, this sounds an awful lot like "Upsetting the Balance" by Harry Turtledove... If any AltHist series needs a film adaptation it has got to be that one!